With virtually every home having central air conditioning in Florida, one would think all the bugs in these systems have been worked out by now. Think again. Whether new or old, AC systems can cause mold issues in our homes if they are not installed with a little thoughtfulness. Many systems are installed with the air handler located in the garage or attics. This means that they operate in what is termed unconditioned space, or in other words, in a room that is full of warm moist air. 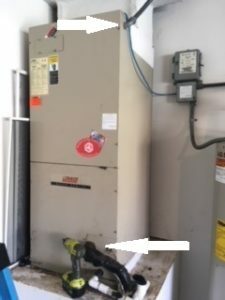 A guiding principle when installing a system in these locations is never let the warm moist air get into the air handler cabinet. The next time you look at one of these air handler cabinets, check out how many holes or penetrations you can see. Each one of these of these holes is a pathway for that warm moist air to get in and cause trouble. Typical entry points for are shown in the photo. Electrical connections and line set entry often have big gaps around them. The suction action of the fan draws warm moist air into the system and that’s when the fun begins. Because the inside of the cabinet is cool, the moist air being drawn in will contribute to conditions where mold growth is possible, usually close to where it first enters. The obvious and correct solution to this problem is to seal the holes. Unfortunately, not many installers do this, but you can. Foam sealants work great for these locations and any others you can find. The mold growth produced from this scenario happens over time and may not cause immediate problems, but for systems that are several years old it may be prudent to open the cabinet and do a real thorough cleaning. We will be posting other discussions about healthy indoor air down the road.